A quick catch up with Worcester and England Full Back Nolli Waterman about smelly kits, travel chums, inspiration and how she earned the nickname ‘Nollie’. RUGBY WORLD: Danielle, why are you called Nolli? NOLLI WATERMAN: My brother Joe called me Danni Ollie and my dad shortened it to Nolli. I also didn’t think I was girlie enough to be called Danielle. No one ever uses it. RW: Who are the practical jokers in the England team? NW: Saracens fly-half Karen Andrew is the biggest. She makes us laugh on the pitch, too, and won’t fail to ask the referee: “How long left?” just before she is about to kick off. Most refs look at her as if she is mad but it makes us smile and relieves a bit of tension. NW: A lineout last season. TJ Sutton went up for a ball, with Nessie Grey lifting. When TJ came down, her boot got caught in Nessie’s shorts – pulling them down. We all cracked up. RW: If you could change one thing about rugby what would it be? NW: Play in the summer or ban rugby on very cold days. A minimum temperature for a match could be introduced! RW: What is the most annoying thing about rugby? NW: Kit – the stinking smell and having to wash it all the time. Even when you wash it, it still smells. RW: Who cheers you up when you’re feeling down? NW: Georgia Stevens – my England and Clifton team-mate. She is always there to pick me up. I live in Cardiff so we’re driving partners, travel chums. We drive thousands of miles a year to England training. Just the two of us! RW: What happened when you made your Test debut – as England’s youngest ever player – in 2003. Any initiation ceremonies? NW: Well, I was only 18 and my mum was there so they had to go easy. I had to sing the obligatory song on the bus and then had the delights of The Sin Bin [a bar] in Limerick as we had just beaten Ireland to win the Grand Slam. RW: What annoys you off the field? NW: People who don’t say please and thank you, and when people – like my boyfriend Leigh – don’t put their cutlery together at the end of the meal. I sit there staring at a plate if that happens. RW: If the world was going to end in five minutes, what would you do as your last act on earth? NW: Eat a box of tomatoes as they’re my favourite food. Strangely, I don’t like sun-dried tomatoes or tomato juice. RW: What is your favourite gadget? NW: It has to be my apple corer. Shove it into an apple and the core pops out. You can also bang it really hard. RW: Tell us about your club training partner, the legendary Liza Burgess. NW: She’s double my age, brilliant, called Bird. She couldn’t be more opposite to me as she is a lock. And she has threatened to lock me in a cupboard before Wales play England in this year’s Six Nations. RW: Who inspired you to play? NW: My dad, Jim, who played for Bath and is still playing for Minehead Barbarians, aged 62. He started me off – well, he couldn’t stop me – at Minehead when I was four and he’s still there for me, not only to work on my skills but to be my biggest critic. 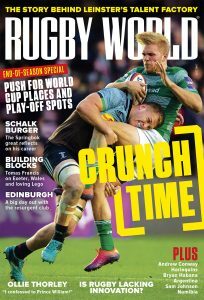 RW: And your rugby wish? NW: To play in the same team as my dad and two brothers. Maybe we could sort out a tournament like they do with vets and I could wear the golden shorts. RW: Win the World Cup or win £10,000 on the lottery? NW: Win the World Cup. What’s money against a winners’ medal?